We must fight back. Congress allocated $141 billion in funding to help the country recover from major disasters—from Puerto Rico to California. We have a once-in-a-lifetime chance to fight flooding, improve our communities, and transform our region into a better place for all residents. Why Do We Need “Prop A” Funding? Most of the funds allocated by Congress require a local match and are competitive. With $2.5 billion in bond funds, Harris County’s goal is to leverage federal funds to create resiliency projects, including buyouts and detention. Federal funds are first come first serve. So, bonds help get federal funds here while they last, helping local flood victims and local taxpayers. Harris County is the only local entity able to address regional flood issues. The Harris County Flood Control District is nationally recognized for its home buyout program and innovative flood control projects. The Flood Control District, Judge Emmett, and the County Commissioners are putting together a plan based on the best available data and research and from community input being collected from meetings in each of Harris County’s 23 watersheds. Harris County can get federal funds and start projects that we need to fight flooding in 2018—if the bond passes. What will “Prop A” Cost Taxpayers and what do they get? Taxpayers will see an average increase of $5 per year in their property taxes and these funds will be dedicated to capital flood control and resiliency projects. Harris County would sell the $2.5 billion in Prop A bonds over 10-15 years, so the overall tax increase will increase slowly over time and will ultimately be no more than 2-3 cents per $100 of home valuation. Senior citizens will pay no additional taxes on the first $200,000 of their home valuation. The Commissioners Court has pledged to spend funds through a process that involves and reflects community input. Taxpayers will see no more than a 1.4 % increase in their property taxes and these funds will be dedicated to capital flood control and resiliency projects. Harris County would sell the $2.5 billion in Prop A bonds over 10-15 years, so the overall tax increase will increase slowly over time and will ultimately be no more than 2-3 cents per $100 of home valuation. The Commissioners Court has pledged to spend funds through a process that involves and reflects community input. 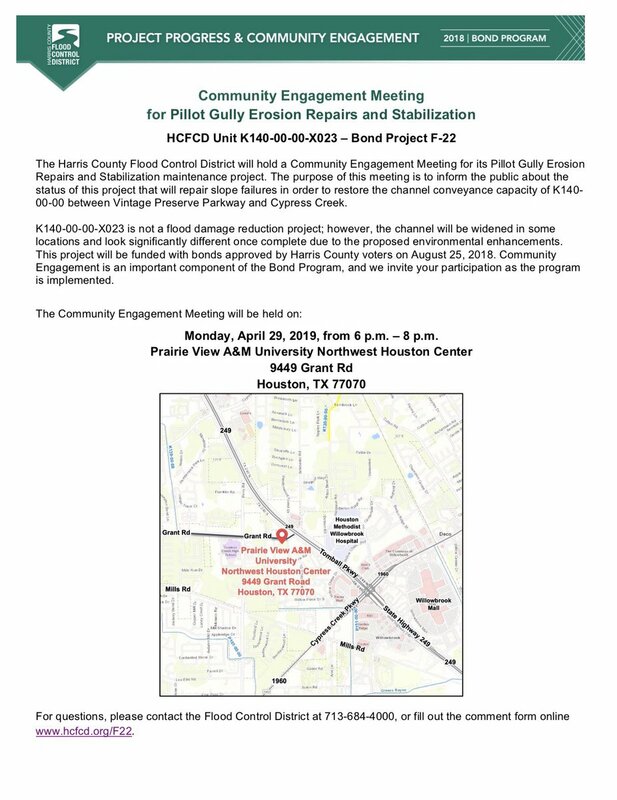 A Community Engagement Meeting for the Pillot Gully Erosion Repairs and Stabilization maintenance project is scheduled for Monday, April 29th from 6pm-8pm at Prairie View A&M University Northwest Houston Center (9449 Grant Rd Houston, TX 77070) More info: https://t.co/AcPGtm12B6. 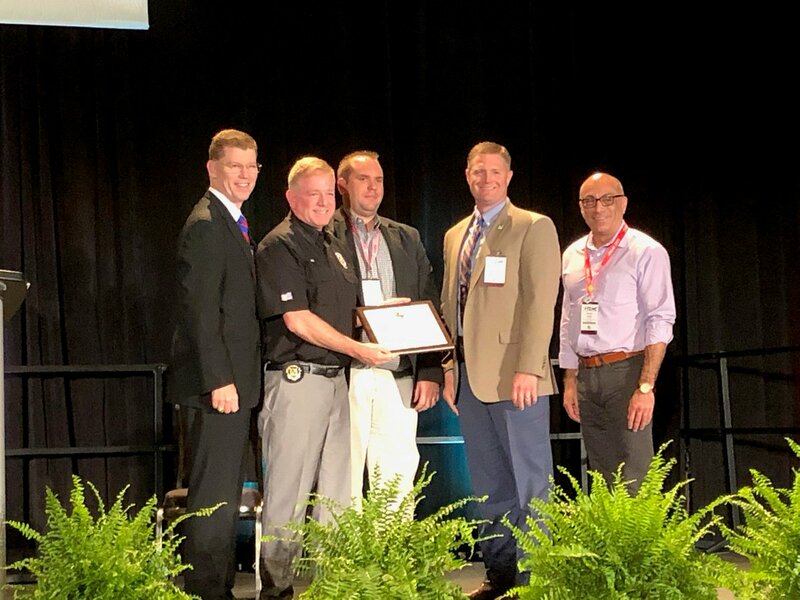 Our EMC Mark Sloan and Deputy EMC Francisco Sanchez alongside our partners from @HCFCD to jointly receive the 2019 Texas Emergency Management Partnership Award at #TEMC2019. News Alert: HARRIS COUNTY FLOOD CONTROL DISTRICT RECEIVES GRANT AWARD LETTER TO UPDATE THE FLOOD WARNING SYSTEM WEBSITE Click for details.